This is one of the most asked questions that a lot of people wants to get an answer since most of the media files are saved in internal memory and sooner or later your internal memory storage runs out of space due to received WhatsApp messages. There is no doubt that WhatsApp is the most popular online messenging app, which is downloaded by billions to exchange messages and media files. Recently, Facebook acquired WhatsApp and added tons of new features such as new status update, video call, adding several admins on a group, etc. But the major drawback of using WhatsApp is that you will have to keep in on your internal memory storage. Even the media files like audio, images, videos, voicemails, etc. are also stored in internal storage by default that causes shortage of internal memory. In this short tutorial, we will show you how to move the entire media collection you received on WhatsApp to external SD card. Please note that it is only possible to move the media files like music, video, images on your SD card and not the WhatsApp application itself. This is the most classic way to transfer WhatsApp media files from one device to another. The idea of this method is to copy the WhatsApp folder on your computer and then paste them to your SD card. You may need an external memory card reader for this part but that's optional. Step 1. Connect your Smartphone to Computer using a USB data cable and wait until it is detected by your PC. If you are connecting your phone for the first time then you may need to wait until the necessary required files are installed. Step 2. Open "My Computer" and double click on your phone device folder. Step 3. Go to internal memory folder and copy the "WhatsApp" folder. Step 4. Now, paste it on your on your memory card folder and delete the original WhatsApp folder from the internal memory card. Additionally, you may insert your memory card on a memory card reader and paste the folder by copying it from your computer. That's it. You may now check your internal memory storage and it should show a lot more space than before. Please note that if you need to move the WhatsApp media files from one device to another then it is recommended to use a memory card reader and then insert the memory card on the phone in which you require to move the files. Overall, the main clue was to have a full backup of your WhatsApp media files on your computer and then you can manipulate it in any way you like. In this part, we will reveal an Android app available on Google Play Store and totally free to use. Please note that your phone must be rooted for this method to work and if your phone is not rooted then halt and skip to the next part. Step 1 . Download ES File Explorer from Google Play Store and install it on your phone. Basically, it is a file manager software that exposes all the hidden folders stored on your smartphone. Step 2. Now, open the internal memory storage device folder and locate to the folder that says "WhatsApp". Step 3 . You will find a folder named "Media" inside WhatsApp folder. Step 4 . 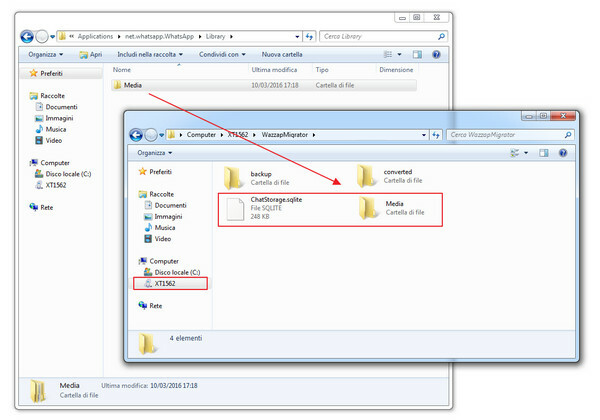 Cut the Media folder and move on to the SD card device folder. Create a new folder and name it "WhatsApp". Step 5: Paste the Media folder inside the WhatsApp folder. Wait patiently until all the media files are successfully moved. Please note that it may take several minutes depending on how much data it is moving. Conclusion: From the above methods, it is conclusive prove that you can certainly copy WhatsApp media files to SD card without any issue. But as the officials of WhatsApp has already declared that the application itself cannot moved to SD yet. They also confirmed that they are working an updated version of WhatsApp that will let your move the application to memory card for your convenience. But even, if that doesn't come ever, you still know how to move the media files to your SD card and make empty room on your internal memory storage.